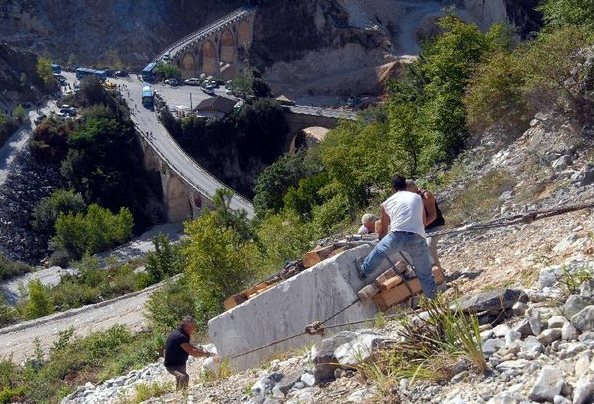 Lizzatura is an Italian word to describe the millenary way of moving blocks of Carrara marble weighing tons down from the Apuan Alps into the valley. 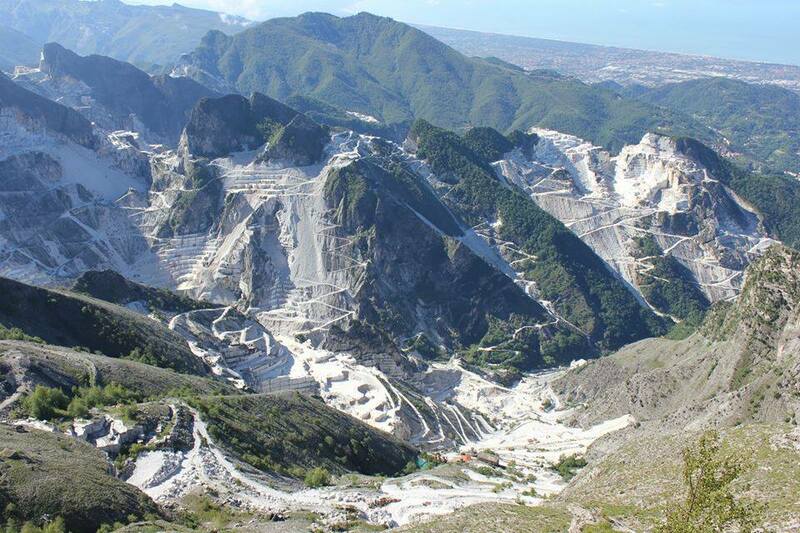 The 650 quarry sites on the Apuan Alps above Carrara (today half of which are abandoned), used this technique until the middle of the 20th century. The method allowed the blocks of marble to descend very steep slopes covered in loose rubble by means of long wooden poles used as rollers and rope. In use since the Egyptian Era, it is useless to say that this system was very dangerous and many lives were lost in the attempt to move these gigantic blocks of marbles on wooden sleds over rollers, with only manpower to hold it back with ropes. There are even notes on the lizzatura handwritten by Michelangelo and Leonardo who both witnessed the hardship of this transportation during the 16th-century when searching for marble for their masterpieces. 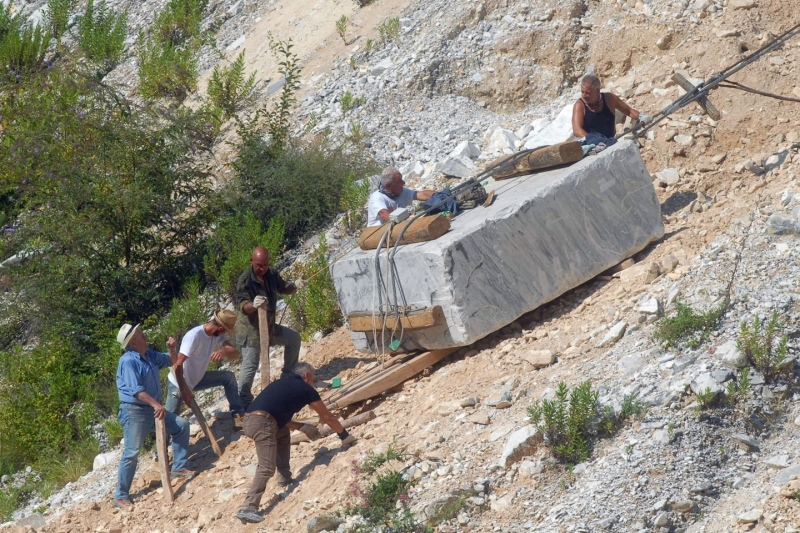 Since 1998, on every first Sunday of August, a historical re-enactment of this marble moving technique is held as a tribute to those generations of quarry workers who during the centuries have dedicated their lives to the extraction of one of the most famous metamorphic rocks in the world. This year the appointment is on August 9th when at 9.15 am at the Ponti di Vara a team of lizzatori will descend with a block of marble of over 20 tons down a 50% slope. It will be possible to study how the men prepare the block and fasten it to the sled and then follow the descent down the mountain until the tip. During this stage onlookers will witness the quarry workers’ high skills and the way they signal among themselves possible dangers due to the loose rubble. Certainly an event unique in its own kind which mustn’t be missed. Questa voce è stata pubblicata in Carrara, Events on the Apuan Alps, Folklore in Tuscany, Tuscan lifestyle, Tuscany e contrassegnata con Apuan Alps, Carrara, Lizzatura, white marble. Contrassegna il permalink.